The Spanish Folk Spirit and its possibilities of future development. The mistake of Nationalisms. | ¡Quieran Oirlo los Hombres! The Iberian Península. 418 B.C. The only reference work in this regard is the recently published book of Jaime Padro, “The Spiritual evolution of Spanish Culture” (currently only in Spanish). This work is based, among other things, in Jaime Padro’s pioneer research on the Spanish Folk Spirit, that I have been able to study deeply, thanks to our full seven-year collaboration. While I share the vision of Padró in their essential phenomenological description of the formative forces of Spain as a country, however, I differ from him on the point of the mission of the Spanish Folk Spirit, specially in his, in my opinion, tend to claim the importance of the Spanish Folk Spirit in Europe, and the importance of the recognition of these so “special” Spanish qualities by the rest of European Folk Spirits, or even Western Folk Spirits, and also, by the Spaniards themselves. In my view, all needs of recognition have their origin in a lack of self-recognition. Perhaps this is precisely the great problem of the Spanish, and more generally latin and mediterranean culture: the traditional inferiority complex, expressed as a excessive pride, a strong inability to listen, and, unfortunately, an also strong tendency to polarization and conflict generation, when facing the differences. The Spaniards, are not traditionally able to manage what we can call “the confrontation with the difference”. Whoever lives this tension, from which, in other hand, creativity is born, feel , at least initially, a strong emotional unbalance, that remains unsolved, if the person has not developed the inner skill of being “consistent”, that is, feeling also the inner trust in his/her ability to internalize and harmonize what is different, what is appearing in his/her life as something new, with what he or she already is. Therefore, the Hispanic trend of remaining in the emotional unbalance, of lacking the inner capacity of creating a sinthesys between what one is (the past) and what, as a difference, confronts me (from the future) creates a kind of stuckness in the past, or as we use to say in Spain, “it’s always the same dog, but with a different collar”. This fixation, this tendency to rigidification due to the fear of change, is in my opinion, a cultural and educational foundation of mankind (we all feel fear facing change in our lives, in one degree or the other), but specially, of the Spanish and Latin – Mediterranean cultures, something that is connected with a very specific feature or even “lackness” of the Spanish Folk Spirit. To justify this view, I’ll try, in the next paragrahps, to outline, in brief and general terms, my view of this specific nature of the Spanish Folk Spirit. Iberian period (End of Atlantis and beginning of the fifth Big Epoch): Formation of the physical body of the country. Spain gradually emerges from the ocean until its current configuration. While some connect Spain with the Lemurian Epoch, which is true in terms of that part of Spain that already existed at that time, in my opinion, one can not yet speak of Spain as far as the setting, not only of the country, but throughout all of Europe is completely different in terms of emerged soil, weather and climate, flora and fauna. The Reconquest Time: Ego Development Era. Reign of the Catholic Kings: Completion of the ego development with the binding of the feminine principle of the country (Kingdom of Aragon, Catalonia, Valencia …- Mediterranean Kingdom, limestone, agricultural …) with the male principle of the country (Castile and Leon– Interior Kingdom, mountainous granite, dry, sheperds..). Both are represented historically in an inverted way, that is, Castile and Leon, the masculine realm, is represented by a woman, the Queen Isabel; on the other hand, Aragon, the feminine realm, is represented by a man, a King, Fernando. When these two principles were able to work together, recognizing objectively and observing the different peculiarities of the peripheral kingdoms (organs of perception of the country) and so, swearing their charters , the ego formation was completed in the right and correct way, and then it was possible to say that Spain, for first time, “existed” as a nation. In this sense, Spain became, in the 14th Century, the first European nation-state, or if you will, the first nation-state in its modern meaning, in world history. Interesting also is the fact that Spain, the first “ego-country” of Europe, had the karmic mission of the discovery (or re-connection) of the American continent. The first “ego-country” of Europe, while ending its own completion, that is, during the conquest of Granada, in 1492 A.C., launch the impulse of re-connecting America with the evolution of Europe, when the Queen Isabel gives permit to Columbus to launch his expedition, originally searching for India. In other words, the first “ego-country”, just formed, re-discover the continent that will become the great place of the individual self- development. Clearly, this process was part of the world karma, ansd shows a clear conection bewteen Spain (the western country in Europe) and America. On the other hand, as we all know, once the ego is completely formed, the laws of blood, or in othe words, the forces coming from the inherited body or lower principle, must stop governing individual life. In practical words, this means that, as an individual, it is no longer “my land” (its folklore, its climate, its customs, its telluric forces, etc. ..) what governs my actions, but my higher principle, which has to dominate and transform the lower one. Of course, this does not happen inmediately, but it becomes (or must become) the guiding principle of human life from its 21st year on, as a first step, during the sevenfold time-between 21 and 28 years, in order to develop the sentient soul, throught going out into the world, and learning so to experience the difference between the world, other cultures, other human beings, and oneself. Coming back to the XV Century, after Columbus discovery, the American impulse, that leads towards the future, and that will be carried by the Anglo-Saxon culture, will be able to conquer and shape the forces of the past in the new continent, by creating a new future, different from the impulse of the middle ages coming from Europe. This impulse, this momentum will have a first climax, with the independence war and the creation of the United States of America, in 1794, and later on, with the final configuration of the United States as we know them today, following the attempted separation of the 11 Southern Confederate States, which leaded the country into a civil war, and finally to the creation of the Union in 1865. In American culture, we can see how the individual ego conquests and transforms the territory, the landscape. It is not Arkansas, or Illinois what influences the individual, but it is their people the ones who conquer the land, model it, and finally declare the existence of the state of Arkansas or Illinois. The individual ego, regardless of their blood or their origin, and based only on their own efforts, conquest the lower principle , and not vice versa. However, and opposed to the Anglo-Saxon impulse, the Spaniards in America were only able to “repeat” the old Spain way; they builded the same Spain again, in the so called New World. While the discovery of the American continent itself opened the way for the future of humanity, the power of the Folk Spirit of Spain was not enough (of course, with historical individual exceptions, like, for instance, Fray Bartolome de la Casas, a fighter against spanish slavery and abuse to the natives in the 16th Century) to create something new. The American continent’s inhabitants and natural resources were used and abused, to finance European wars, with the only aim of holding the old forces the blood and the hierarchical pyramid principle linked to it, and represented essentially by the impulse behind the Catholic church. The famous “Spiritual Western Reserve”, the “Holy Alliance” and “The Hundred Thousand Sons of St. Louis”, and the wars of Spain against the countries that carried at that time the impulse of the development of the higher self (England, The Netherlands, and finally the EE.UU in the 19th Century), will be in the next centuries, clear symptoms of Spain getting stuck in the old forces that come from the lower body, and of its inability to fertilize this lower principle with the forces of the higher spiritual principle. Indeed, the final act of the the tragedy was carried out when the Catholic Kings seek to perpetuate an empire based on “blood”, through marriage alliances. Instead of realizing the the true principle of their power and capacity to create a nation recognized by all the peripheral kingdoms has been the power coming not from their blood but from the combination of their individualities, Isabel and Fernando continue the process that sadly had begun Henry IV of Castile, trying to marry his daughter Joanna, known as “la Beltraneja”, with whoever could ensure the continuity and growth of the kingdom of Castile, either Portugal, France , Aragon and Naples, and regardless of the individual development of Joanna herself. Here we see again the force of the blood, of the group, of the heritage, dominating the individual ego. This process will be continued by the Catholic Kings themselves, first trying to get married again Joanna, that at that time was 17 years and had undergone at least two previous marriages (the Duke of Guienne, brother of the king of France , and later with Alfonso V of Portugal) with his son, Prince John, uniting so Castile and Aragon with Portugal, and having all of it under its hegemony. This marriage did not take place, as Joanna chose to go into the monastery of Santa Clara in Coimbra, Portugal, where he remained for almost the rest of his life. Years later, however, some historical sources indicate that, after the death of Isabel, Fernando of Aragon proposed marriage to Joanna “la Beltraneja”, resurrecting so the union of Aragon and Castile, and thereby, ousting Philip the Fair, who ruled on behalf of his daughter Joanna, later dubbed “The mad”. The case of Joanna “the mad” is quite a similar one: a soul, educated not to be an individual, but to serve the interests of the kingdom. After meeting Philip the Fair, fell in love with him very intensely, but later, she becomes literally sick of jealousy, Phillip losing interest in her. This lost of interest of Phillip, made her completely mad, becoming, literally the “mad queen” of Castile. It is interesting to remark, that while the Catholic Kings wanted externally an union with Northern and Central European monarchies – what will give birth to the great Habsburg dynasty in Europe, that will rule most of Europe and the world with an iron fist for the next three centuries -, the true evolution linked to theses peoples of Northern Europe, and in particular to the Anglo Saxon culture, moved silently through the conquests of commercial maritime routes dominated by the Arab world, first by Portugal, later by Holland, and finally by England. The way to a new world, based on global commerce, on economics, and on the individual ego, was completely unnoticed by the Catholic Kings, and during the following centuries, it will be so also for the Spanish and South-American culture. The surrender of Granada, by Francisco Pradilla. All this makes clear the fact that the Catholic Kings did not understand the force that had been able to create Spain as a nation, that is, what emerged from the union of two different personalities, the unique and excellent combination of their individual capabilities as Kings and as leaders of a country, something with such a quality that could be recognized by the peripheral kingdoms. And this new quality did not come from the blood, but from their higher principle. Have they understood this, they could have created a new country model based on the individual and its meritocracy, rather than perpetuating the castes of nobles and oligarchs, as Charles V and Phillip II did; unfortunately, instead of making Spain more European, the future spanish Kings would try to make the rest of Europe more “Spanish”. We can also see this historical symptom in the fact that, as it were, the other European countries call on Spain and on the Empire to allow the expansion and development of the individual ego (Luther against Charles V, cause of the independence of Flanders, and of the enmity and war between Spain and France and especially Spain and England), something that Spain, with the support of Rome, refused again and again, creating so the European wars that bleeded Europe for centuries. In all these events we see over and over the edge of the Folk Spirit of Spain: The Folk Spirit of Spain has not inner strength enough to overcome the impulses coming from the lower principle. In terms of Steiner, in Spain the Spirit of the Language (a spirit of Form that acts as an Archangel) prevails over the Spirit of the Thought (an Archai acting as an archangel) and above the own Folk Spirit itself (an archangel of regular evolution). This predominance of the Spirit of the Language, makes particularly strong the specific characteristics linked to the different geographical areas, that are reflected in the shape of the larynx, and as a consequence, in the language. In fact, they are stronger than they should be, creating thus a kind of Luciferic atmosphere in the Spanish soul, and enhancing speech and language creative impulse over clarity of thought, or over the legitimate impulse of the Spirit of the country. This is also why the spanish thinkers are not and have never been philosophers of crystalline thoughts, like for instance, the German ones, but, on the opposite, much more essayist and writers alike, as Ortega y Gasset, Miguel de Unamuno and Zubiri. Hence also the continuing problems of nationalism in Spain, all of them specifically related to language issues. What we have here it is not other thing than the repetition, over and over, of the war between all of the different natural and environmental “etheric” forces that formed the different areas and cultures across the country. Bygone as legitimate evolutionary forces, these forces make up the language, and the geographical areas or subcultures of a country, and as such, the try again and again, to develop the individual ego, or in other words, to define their own limits, fighting with the other areas, that is, rejecting their neighbors in order to self-affirm their own identity. But, through this process, in the modern time, their true identity will never be achieved, since this process makes impossible for this ego to be transformed by its higher principle. Indeed, the higher principle is, precisely, what comes to meet one from the other, from the foreign, from what is different. We could say that the higher principle appears in the social realm as the obstacle that the other person, in this case, the other culture is planting in front of me, apparently stopping my development, but really, calling for the development of the inner skill that will be able to overcome the obstacle. This obviously is not just applicable to Catalan or Basque nationalism, but in the same way, to the so-called central Spanish nationalism, which really should be called, Castilian nationalism, as it is linked to that language. Thus the history of Spain has been for the last three centuries, a history of wars and internal conflicts, for it seeks to achieve by external means what is only possible by inner means, that is, when each Spaniard, or a majority of them, or at least one group of visionary leaders, can marry within themselves their inner Queen Isabel and their inner King Fernando, that is, the impulses coming from their body and the impulses coming from the spirit, or higher principle. This marriage of the lower and higher principles will only be possible through a culture of the soul, a culture that promotes the listening and understanding of apparently opposed but truly complementary principles. In doing so, a space for a new future will be created, and a new Spanish culture, that perhaps can carry out a Republic of the Federated United Nations of Spain. As a consequence of not overcoming this threshold, the country suffered a strong process of aging and death, since the time of Charles V until the Spanish civil war in the 20th century. Having reached the stage of the development of the ego (21 years in the individual life) on the XVth century, the country started then the development of the sentient soul, still based on the experiences that the astral body can have, but now permeated slightly by the I. Unable to develop the rational or the conscious soul, even when slight features of the rational soul appeared in Catalonia, and of the consciousness soul in the Basque Country, from the XVIIIth century on, the country suffers a progressive death, losing more and more its outer territories, until the final lost of Cuba in 1898. After 5 centuries, all the expansion of the Spanish Empire in America and in Europe has disappeared and the geographical limits of the country had come back to the ones of the XVth century, with the Catholic Kings. After a strong impulse of expansion, or what we can call, a strong development of the sentient soul, then is coming, as a contraction, the impulse of the rational soul. This impulse is the soul force that makes possible “interiorizing” the outer experiences, so that one can feel them and think about them. But the Spanish Folk Soul, unable to develop the rational soul, lived this new impulse as a death of the past glorious times. All the writers, most of the spanish artists, in the eighteenth, nineteenth and twentieth centuries, live this process as a tragedy and death, instead of recognizing the interiorizing force that could have created a new future for the country, much more linked with the individual impulses and not to the collective ones. We can see, as a kind of presentiment of a potential future, how the folk soul shows us that, through the art, the transformation of the sensitive soul in the Spiritual Self will be possible, and today happens only artistically, in an intuitive and unconscious way, that is, not in a free way. That is why, in Spanish art can be found a strong tendency not to transform reality but to show the aspiration, the ideal that was never achieved. This trend can be seen in the writers of the Golden Age, in the XVIIth century, and I include in them, though perhaps erroneously from the academic point of view, to Cervantes and his Don Quixote. These authors show us in “Fuente Ovejuna”, in the poetries of Quevedo to the Spanish King, etc. .. the aspiration of what “could have been” but never was. It is a kind of a continuous melancholy. Also for example, Velázquez, who painted in “Las Meninas” the act of painting itself, or the reality behind the reality in his famous painting “The Spinners”, shows a possibility, a big ideal, that neither the people nor the political leaders and culture of his time could recognize. Finally, making the story short, Francisco de Goya, after portraying the reality of his time with a very personal nuance, experiences the darkness and savagery that underlies to the reason, to the cold Enlightenment and to the French influence, an experience that, as we have seen, is actually quite Hispanic . The Hispanic Soul, through Goya, can not win the battle against the darkness of the intellect and the reason that live within the rational soul first and within the consciousness soul later, but without which it is impossible to experience freedom. 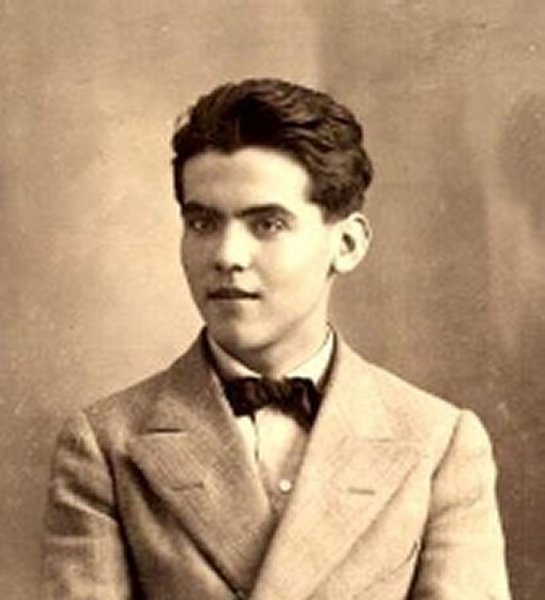 Already in the twentieth century, the figure of Federico Garcia Lorca, and with it the generation of 27 as a whole, symbolizes, in my opinion, the emergence through the art of an apparent fresh new impetus of transformation, of possible resurrection of the Spanish soul, that in the case of Lorca takes a very definite form after his trip to New York. However, this impulse, again, as in Goya, will show his inability to accept the death of the old, the death of the “Southern” impulse in order to enter fully into the darkness of modern consciousness. Thus in Spanish art we see once and again, the secular difficulty of the Hispanic soul to let die the old vital heat of the will, the unconscious wisdom, in order to make way for the dead and rigid conscience, the prelude of freedom and of the spiritual rebirth. In the path of light through the darkness and back into the light, the Hispanic soul stays on the first step, for fear of losing his being in the leap of faith, and again and again, on facing the emptiness, it answers with gestures of reaffirming fire, that will soon prove futile and vain. Therefore, the continuous and nostalgic memories of the past, or in other words, the memories of the future that could have been and was not, is not and will not be the way forward for Spain. That trend only keep us prisoners of the haunting image of the unrealized potential of the Spanish soul, rather than allow us to experience our present actions and its current consequences, including experiencing errors and mistakes, and, with that, living the process of learning and development. Only this process of learning through the interiorization of our actions will make possible to affirm and consolidate, to build, step by step, all that we really are and can become. The experience of the darkness, the experience of making mistakes, makes possible turning on the light of learning experience, which, without the previous darkness, would never be able to bring the shining of the future. And yet, somehow, the Hispanic soul knows that this threshold of death and darkness,must be crossed. And, in my opinion, this is at least one of the reasons why bullfighting still remains as a cultural icon. I do not pretend here to justify it in any way, but only to describe what lies behind it as a kind of occult and quite unconscious impulse, as also behind its popularity. Indeed, in the ritual of bullfighting, linked to the ancient cult of Mithras, the bullfighter represents the higher self, dressed in gold and purple, which triumphs, channeling the instinctive forces of the will deep, represented by the bull. Faced with the horizontal and powerful metabolic forces of the bull, the bullfighter, the representative of the Higher Self, stands upright and conscious, overcoming the forces of fear originated on the lower principle. This ritual, as an unconscious image of the future, is what attracts powerfully to the masses that fill the spanish arenas. It is the vision of an inevitable but extremely difficult future to face for the Hispanic soul. And perhaps it is so difficult because of an small but important detail: to overcome fear, first,it must be felt. Or putting it in another way, to become a bullfighter, inevitably, one must go down to the arena and get in front of the bull, experimenting there all kind of emotions and impulses of fear. If I never go into the darkness, I will never be able to leave it. Therefore, and perhaps painful to say, may be that the famous Spanish fury, is no more than a reaction of pure recklessness or even deep cowardice on being confronted to the vacuum. We still need to learn to be truly brave, that is, to find the right mean between cowardice and rashness. The new Spanish culture, the future of Spain, can not develop from a daydream, but from a patient and conscious process of devotion and sacrifice, letting the mistakes to happen, and learning to slowly ripen the wonderful fruit that the spirit of this country hidde. This fruit, in a not long future, will be given to to the North peoples for the construction of Europe. In the same way that Goethe could only develop his theory of color and the theory of the metamorphosis after joining the Germanic and the Latin souls within himself after visiting Italy, also in this way will Europe be born, uniting the North and South spirits. Only the strength of the light coming from the north can stand before the inner bull of the soul, releasing him from his task and letting new life forces arising from the metabolism of the bull, to transform the “Taurus” in the zodiacal forces of the Holy Spirit, transforming the the bull in the dove. When this happen, the Soul of Spain, Juana “the mature wisdom coming from suffering”, will someday join the Soul of the peoples of the North, Philip the Handsome, so that together, they will give birth to her daughter Europe, “the one with a beautiful and wise heart “. Said the above, I have to say that today in Spain, due to the rebirth of nationalisms, there is a lot of , sorry to say, nonsense discussion, specially between anthroposophists, formulating questions as: Is there a Catalonian Arcangel? or a Basque one?…are this Archangel of the same rank that the spanish archangel or not?…Is it the spanish folk soul then an Archangel or an Arkai?……All that, formulated in these terms, are merely abstractions that put at the service of our own desires. This is using Anthroposophy as a mean to justify our desire of self-reaffirmation. In other words, is a very strong spiritual egoism. We are not “Catalanoians”, or “Basques”, or “Madrilenians” or “Andalusians”. I can feel it so, true, but I’m not that. I’m not what I feel. These feeling is what comes from our lower principle, from our etheric and blood heritage. But what makes us really human is not this impulse, but our higher principle, what unites us as human individual egos, not because of our binding past, but in our search for a future of coexistence and peace for us all. That is the true meaning of being “Spanish” and being “European”, two qualities yet to be created, and somehow, strangely or perhaps not so strangely connected throughout history. Guggenheim Museum, Bilbao. Basque Country. Spain. These are, in my humble opinion, the questions that can lead Spain, and perhaps also Europe, into the future. Dedicated, despite our differences, and with all my gratitude to Jaime Padro Martín de Pozuelo, for his tireless work, effort, and love, to the Spirit of Spain. I’m a retired Waldorf teacher in Germany and just found by “electronic chance” your inspired article. It would be a pleasure to discuss a few angles of the matter with you. Please let me know if you are available and how I can reach you. I was born in Portugal, lived for more than 20 years in Brazil, and live in Germany since long. Of course I could improvize and write in Spanish (with more errors as in English…). Just let me know. It would be a pleasure to discuss with you on this issue. I’m completely available, and we can discuss it in English. In this way I’m sure that communication would be more fluid than discussing in Portuguese or in German, both beautiful languages that I don’t speak yet. It appears like most of my comments are not getting posted on on your blog site. Do you already know if there’s a problem with your web page?